Mike: Last week we ran a guest piece from Abigail Dillon discussing her love of the From a Certain Point of View story “The Baptist”, focusing specifically on Omi the dianoga’s status as one of the very few “monstrous” female characters in Star Wars. In our earliest discussions of the story, Abigail had a more expansive analysis in mind, having been taken not just by Omi but by how Nnedi Okorafor “ascribed meaning” to A New Hope‘s trash compactor scene. I was just starting FACPOV myself at the time, so I jumped ahead to “Baptist” in order to more fully imagine what sort of material might be written about it—and I was, frankly, less impressed than she was. Don’t get me wrong, I thought it was an excellently-written story and I loved the picture Okorafor paints of dianogan psychology and culture, and Omi’s perspective in particular. But at the titular baptism, she lost me. I’m keenly aware that this reaction was borne out of my own history with Star Wars as much as the work itself (and seems to be the minority opinion within my circle of fandom), but as soon as I realized the significance of what was happening all I could think was “Skippy the Jedi Droid”—the old Legends comic story in which R5-D4 is secretly a Force user and fakes his malfunction so that R2-D2 can continue his mission. While it was nothing more than a silly little tale that served to underline Star Wars Tales‘ non-canon status, over the years Skippy became a poster child for the Expanded Universe phenomenon of ascribing outsize significance to every little thing that happens in the original trilogy. So with the reboot clearing away Jedi aspirant BoShek and Death Star IG-88, I went into FACPOV expecting more emphasis on basic storytelling and less on “the tallest Jawa is really Boba Fett”. And by and large, I got that—but even now that I’ve read the whole book, Omi still stands out to me. As I said in our group piece on FACPOV, some of my favorite stories were the ones in which a bit player furthers the heroes’ quest not because the Force demanded it but out of a simple act of kindness (which from a certain point of view is the Force’s way of demanding it). As it happens, the new R5-D4 story, “The Red One”, is maybe the perfect example of this: Arfive is hinted to have some rebel connection in his past, but he isn’t anything special, and he doesn’t receive any visions that convince him to let Artoo take his place; indeed, to do so almost certainly means consigning himself to the scrap heap. Nevertheless, Artoo makes his case and Arfive simply chooses to believe him—and is rewarded for it with at least a slim chance of survival. For my money, this was a much more interesting way to approach these kind of stories—mundane actions and decisions that add up to something beyond what the players realize. If Omi had been mildly Force-sensitive (she’s certainly more attuned to nature than your average human) and something deep down had told her to let Luke go instead of eat him I think I would have been fine with it. But turning a hungry monster into a “baptism” ritual, while I can accept it and it doesn’t break the scene for me, just feels like a step too far. That being said, I’ve seen a lot of love for this story and Abigail’s passion for it spoke to me, so I thought this would be an interesting subject for us to hash out in public. Abigail, how about it? Earlier you characterized FACPOV as containing a number of “Skippy”-type stories, but I really don’t see it that way—what do you make of the different lines we’ve drawn here? Was there any story you did think went too far, or for that matter, is there even such a thing? Abigail: I think it’s funny that you used the phrase “break the scene,” because in my scattered writings to put together something cohesive for this discussion, I used that exact phrase to describe my reaction to the scene in A New Hope without Omi’s presence. I’ll get to the context of FACPOV in a moment. Right now, I’d like to talk symbolism and why Omi improves the trash compactor sequence for me. 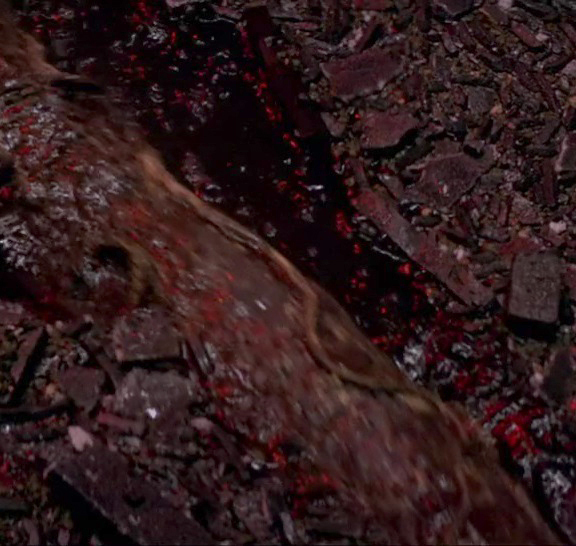 Within the structure Lucas uses to craft A New Hope, the dianoga’s attack is lacking without Omi and her baptism. If you’ll pardon the librarian metaphor, a story is like a database. You have the complex structure beneath and a user interface on top. If the user interface (the plot, characters, narrative framing, etc.) is good, you don’t need to understand the deeper functions of the structure (symbolism, literary theories, the craft of writing/camera work, etc.) to use (enjoy, understand) it. On the other hand, if the user interface promises a certain robustness in its functionality, and then doesn’t provide it once you get past that initial search, well that’s flat-out bad design. And I feel like ANH hits that point with the dianoga. It doesn’t break the movie or the scene for me, and there’s a part of me gaping in horror that I’m about to go after one of my favorite Star Wars movies like this, but within the structure Lucas uses to craft ANH, the dianoga’s attack is lacking without Omi and her baptism. I presume everyone is at least passingly familiar with the Hero’s Journey, correct? Now, usually, I wouldn’t whip out Joseph Campbell’s theory as a means to critique a story. To analyze? Yes, extensively. But while the Hero’s Journey has become a major influence in western media, it is not gospel, and if storytellers want to avoid it because of the misogyny and racism built into Campbell’s original text, I’ve got nothing to critique there. The difference with Star Wars, especially the original trilogy, is that Lucas cites Campbell’s work and the Hero’s Journey in particular as a major influence, giving us the ability to compare intent with execution. For the most part, Lucas’ intent to put Luke through this Journey works on both the user interface level and the structure level. Instead of just using the Journey as a bit of window dressing to pretty up the story, each step that Lucas uses has a function. For the Crossing of the First Threshold, the passing from the normal world into the special world, Luke literally steps over the threshold of the cantina, and everything in the following scene is used to demonstrate how out of his depth he is. The First Threshold is invoked again when Luke opens himself up to the Force for the first time, and Obi-Wan says he’s “taken [his] first steps into a larger world.” Again, more than just pretty words, Luke’s connection to the Force is essential to the story and to his character development. And this is a continuous standard throughout ANH. Every time a step of the Hero’s Journey is invoked, it demonstrates either something about Luke or about the forces he’s up against. Well, almost every time. The trash compactor scene as a whole works as a means to trap our leads together and establish the dynamic between them. It also gives Luke another chance to demonstrate problem-solving skills and leadership, laying the groundwork for when he takes command during the trench run. This scene was essential to the telling of the story. The dianoga wasn’t. At least not in the manner she was originally included in the movie. In the context of the Hero’s Journey, this scene most closely ties to the Belly of the Whale, in which the hero dies or appears to and then comes back to life. But the Belly of the Whale is about more than just death, actual or appearance thereof. It’s supposed to be a transformative experience for the hero, something that prepares him for the coming trials. In ANH, Luke just appears to drown then pops back out of the water. There’s no noticeable change in him from that scene. We have this great user interface, but no structure to support it. Omi’s baptism provides that structure. It shows that something transformational did happen to Luke there, even if it remained unseen. It makes the Belly of the Whale step up to be more than just window dressing, and in my opinion, raises the quality of that scene to match the rest of A New Hope. Look, there are only so many dianoga pictures out there. And that brings me back around to the FACPOV context. I really like what you said about the small acts of kindness putting in motion the grander movements of the movie’s narrative. These choices aren’t overtly Force-dictated; they’re just people trying to do the right thing in a small moment. And for the most part, I do agree that those types of stories work best in FACPOV; two disparate tales coming together in a small moment and then parting company, each a footnote in the other’s telling. However, because of where Omi’s tale lies both in FACPOV and ANH, I think it’s good that this is the exception to the rule. It’s important that it builds to this moment of Force-dictated action because of how ANH itself is structured and is lacking in its structure. So throwing the ball back to you: in our initial start-up discussion about “The Baptist,” you said that you felt the story was “above and beyond what Lucas intended with that scene.” To you, what is the purpose of that scene and the dianoga, as it is portrayed in A New Hope? And with an admittance that ye olde EU did go too far, do we really not have place in the new EU for stories of the Force actively at work in the small moments as well as the huge game-changers? Mike: Ha, I actually agree about Greedo when it comes to his story specifically—it’s almost 2018 and I don’t want to keep harping on the “Legends did it better” thing, but for all the expanded backstory Greedo has received thanks to his inclusion in The Phantom Menace, I was pretty disappointed that Renée Ahdieh ended up with something as hackneyed as “Han stole Greedo’s girlfriend”. Greedo was a young scrub in the EU and it should’ve been left at that, the same way Han and Boba Fett don’t need some great rivalry for Empire to work. Anyway, your take on the dianoga scene is fascinating and I totally get why “Baptist” meant so much to you in that light, having been unsatisfied with it for so long. While I wouldn’t call myself a big Campbellian personally (I have Mark Eldridge for that) I’m conversant enough to recognize the broad strokes of the Belly of the Whale moment, but the deeper significance, the “rebirth” aspect, is something I’ve never really noticed or thought about. To my mind, the trash compactor is the Campbellian device much as you describe it but the dianoga specifically is more about Lucas’s genre inspirations—he wants every movie to have a monster scene. Maybe partly for what it communicates about man versus the natural world (a theme that comes to its conclusion with the heroes’ enlistment into the Ewok tribe) but also just for the visceral, pulpy thrill of it, the same reason he wanted a podrace in TPM. That said, while my reasons are different I’ve never been particularly wild about it myself, which is why Okorafor’s recontextualization doesn’t overly bother me. I experience the dianoga the same way I experience the wampa and the rancor (and come to think of it, the rathtars)—as a semi-rote sequence that’s mostly there for younger viewers who are more easily thrilled than I am. It’s just one of those things Star Wars does, the plot equivalent of “I have a bad feeling about this”—so really, it was already a ritual of a certain kind. If you think of the Force as a character in its own right ANH is sort of its own Call to Adventure. Given my take on the Force doing its thing via “small acts of kindness”, I do think there’s a place for that kind of material in the new canon, especially in ANH. This might sound a little out there, but if you think of the Force as a character in its own right ANH is sort of its own Call to Adventure—the Prophecy of the Chosen One has been slowly falling into place over years and years, but the existence of the Death Star is such a major threat to life itself that the Force suddenly has to get up off the mat and act more overtly than it might otherwise, which manifests in all the little strokes of luck starting in Rogue One and ending with Luke’s torpedo. I saw a great post on Tumblr recently about The Force Awakens from Luke’s point of view: imagine you’ve hidden from the galaxy for several years and then one day a strange girl shows up in your best friend’s spaceship and literally hands you the lightsaber you lost down a giant pit three decades ago; how do you see that as anything other than the Force slapping you in the face and telling you to get going? To my mind ANH is an “awakening” in much the same way, a bunch of important players suddenly being shoved together after decades doing their own thing. So I guess the thing about Omi for me is that while it’s just one improbable event in a big string of them, I don’t see the practical function of it. You’ve explained how it strengthens the Campbellian function of that scene, and I’ll gladly concede that point, but what does the baptism actually accomplish in “real” terms, for Luke’s character or for the Force’s ends generally? If a character development occurs totally without the character’s knowledge and makes no discernible difference on events, what exactly is it adding? Abigail: I do have to agree that pulpy thrill has merit all on its own. Far be it from me to dismiss that sort of visceral fun when I unironically love the Tim Burton Planet of the Apes remake from 2001. Your other take on it, the “man versus nature” theme, I hadn’t picked up on, but considering it now, that’s some good text/subtext going on there, especially in the original trilogy era. It gets even better as we consider how the Empire has treated the natural resources around them (see Ahsoka, Thrawn, Rebels), and Omi’s yet another victim of that. It makes the defeat of the Empire by the Ewoks even more fitting, but now I’m getting off topic. For the character development that Omi provides Luke, I have two responses. The first dips into the headcanon arena. This shedding of the skin in a spiritual sense might have been what helped Luke open up to the Force enough to hear Ben after death. Being brought that close to death may have made a connection there that allowed Luke to access the Living Force in a manner that took Qui-Gon, Obi-Wan, and Yoda all years to master. I have no real evidence for this, just theorizing here. “The Baptist” is about Luke and his development, yes, but it’s moreso about Omi, about her coming to terms with who and where she is. I compared her to Obi-Wan Kenobi briefly in my guest piece, and the more I think about it, the stronger the parallels become. If we look at ANH in the way you compared it to the Tumblr post about TFA, I think we could replace Luke’s TFA perspective with Obi-Wan’s in ANH: he gets a message from Bail Organa via Anakin’s daughter, delivered by Anakin and Padmé’s droids, whom he finds because he comes to the rescue of Anakin’s son. This is the Force kicking Obi in the pants and saying “It’s time.” Throughout the canon that we have (and the old EU too, because Disney can pry Miller’s Kenobi from my cold, dead fingers), we know that the Force was critical for Obi-Wan as a person, especially in his exile on Tatooine. That is what sustained him. In her exile in “The Baptist,” the Force is what sustains Omi. It’s what keeps her going, keeps her from stagnating in her imprisonment. And like Obi-Wan, following through on her Force-given mission to help Luke is what gives her peace in death (and potentially after death). The titular baptism is internally valid to its story because it’s meaningful not necessarily to the Force or to Luke, but to Omi. Again, that does kind of render my argument about the dianoga scene a touch moot. Why should I then care about how “The Baptist” uplifts A New Hope when it’s entirely valid on its own terms? For that, I give my best Kenobi smirk and say, “overanalysis is our speciality”. One of the things that I like about short stories is when they take something that seems obvious and then approach it from an utterly different angle. For example: A dianoga is clearly a hungry monster. Story: What if our dianoga actually were…. This is one of the things that this book excelled at – Nera Case’s sorrow during the final celebration, Obi-wan’s confusion at death (instead of serenely confident) – these were wonderful new angles to take on familiar scenes. And some of them, I didn’t like as much. They didn’t resonate with – crazy bad day stormtrooper wasn’t my cup of tea – but it still was an interesting angle. And the point isn’t that they need to be practical or add to the greater collection of the EU or Star Wars mythos — a short story isn’t a serial. Serials build one off of another – short stories can step outside of the flow of the story, of the great “points” and simply brush up against the story in a tangential but interesting way.